Those are the words of my country’s president, Rodrigo Duterte, whom you may have heard of. “Clearly, he’s a colorful guy,” Barack Obama said, after Mr Duterte called him a “son-of-a-whore” for criticising human rights violations occurring now in the Philippines. Shocking, isn’t it? I see concern in your faces. How could such a beast come to power, when the Filipinos you know are warm, hard-working, law-abiding? Among such wonderful people, how could a ruler like Duterte be so popular? It’s a long story. I’ll start at the end. Last year, on the final day of campaigning before our presidential election, I attended the rallies of each of the five candidates. I didn’t go to hear the politicians, because they usually make the same promises. No, I went to understand the concerns of the voters – to learn the hope behind their vote. In one rally, voters believed in the patron who provided for their city. At another rally, members of the middle class supported the incumbent party and its promises of economic prosperity. At a third, the disenfranchised had faith in the compassion of a moviestar’s daughter. At the fourth, students voting for their first time were convinced of their feisty candidate’s incorruptability. Mr Duterte’s rally was completely different. His supporters came from across the nation, through all classes and age groups. His rally was huge, filled with infectuous optimism – people in costumes, with picnic baskets, flying kites they made by hand in Duterte’s honor. As one elderly observor said, shaking his head in wonder: “It’s like People Power all over again.” He was referring to the mass protests three decades earlier that ousted Ferdinand Marcos and restored democracy after 14 years of dictatorship. Prior to this election, I opposed Mr Duterte for four reasons: his promises to kill suspected criminals, his disdain for democratic checks and balances, his warmth towards an encroaching China, and his allegiances with crooked politicians including the heirs of the dictator. I heard Duterte’s promises and I exercised my democratic right to not choose him. But at that final rally, on that intoxicating night when Filipinos made their choice clear, it felt like Duterte’s campaign slogan would be proven true: Change is coming. I began to doubt my doubts. Maybe I was wrong. Maybe he was different. Maybe his violent rhetoric was just drama, as his supporters claim. I confess, I came to believe in Duterte, because any leader who can evoke such optimism among Filipinos – that is a leader I will support. Not because I believe in him, but because I believe in the power of the Filipino people to do great things when we are moved. He said he knew Duterte was a risk, but it was worth it for a chance at real change. “It is up to us all.” How can we argue with that? And because it is up to us all, to each of us politics is personal. That’s why our story tonight is not about Rodrigo Duterte. I started with his words only because, at a forum for democracy, where we look apprehensively at populism around the world, for me as a Filipino to not mention him would be to ignore the elephant in the room. And if you’ve ever shared a room with an elephant, as I’m sure you all have, you know what matters isn’t the presence of an unpredictable beast – what matters is the fragility of that room. This story is my country’s, and also mine. Not because the story of my self is the story of my nation, but because the story of my nation is the story of me. I’m proudly Filipino, though I look Chinese, sound American, have a Spanish name, am an atheist among a majority of Christians, lived in Canada during the dicatorship, and returned home afterwards to grow up privileged in an impoverished society. The Filipino experience is complicated. Did you know we are Asia’s oldest democracy? In 1898, we ended four centuries of Spanish rule and established the continent’s first free republic. Our constitution was based on what was proven good from all the great constitutions of the world. But our ally the United States betrayed us and conquered us into a colony – in what they called a “benevolent assimilation” – promising independence only when the élite among us could learn to govern democratically. When the Second World War arrived, Japan spun its brutal subjugation as ‘liberation from the West.’ After the atomic bombs ended the war, America finally gave us independence. Our new nation was broken, yet free. But in a paradise like the Philippines, war seems inevitable. Our leaders fought those who sought equality through communism, until years later that struggle gave Marcos a handy excuse to suspend democracy, extend his presidency, and plunder our economy. Into that trauma I was born. That was my generation’s inheritance. Just as what is happening today will be inherited by the students I teach. My hope is that we can give them something worthy of their hope. My teenage years, you see, were blessed with the optimism of a newly liberated country. After the dictatorship, my family finally returned home. My father’s business was soft-drink bottling but his dream was public service, and he ran for office because at the time anyone could. I saw campaign trails and grand plans, then the dirty tactics he faced, and the hypocrisy of those around him when he was in government. I hated politics because I saw what it promised, but I knew what it does. Then one day, at the turn of the millennium, as I was driving to the supermarket, the convoy of the son of President Joseph Estrada parted the traffic with blazing sirens and windows bristling with guns. Out of foolish principle I refused to cede my right of way. They pursued my car, cornered me at an intersection, and alighted to beat me and pull me through my open window. I was saved from god knows what only by revealing my surname – the only time in my life I’ve invoked my father. Thus I learned how in the Philippines only privilege ensures safety. That’s when I became political, because politics is personal – as personal as a fist in your face. When the massive corruption of the Estradas drove Filipinos again into the streets, I marched for my first time, believing fully in the woman who would oust him. I thought the ends justified the means, even though President Estrada had been democractically elected. Hope came easily after we replaced him with Gloria Arroyo – a wealthy economist who went to Georgetown with Bill Clinton. When she ran for re-election against Estrada’s best friend, and was caught cheating in the polls, I supported her still. Justice had to be served to deserving criminals like Estrada. But Mrs Arroyo turned out as bad as the rest, pardoning Estrada for political gain, and overseeing nine years of corruption. When Benigno Aquino III was voted in, the proper democratic transfer was a breath of fresh air. I hoped our tiger economy during his checkered six-years would push us into prosperity – that the promise of ‘eventually’ would prove good enough. It didn’t. A promise of eventually, however realistic, is easily replaced by a promise of soon. Change is coming, Duterte vowed. He promised he’d solve the drug problem in six months. He’d succeed, he said, or step down. Six months and one year later, his popularity has exonerated him from broken promises. It’s also cost thousands of lives. And destroyed thousands more. In one slum in Manila, I interviewed a family whose father organized religious processions and had just passed a drug test and police clearance as part of a job application. Yet one night he was lined up along with nearly 80 others as police led the women and children out of sight. The men were arrested without warrants or due cause, slapped with random charges, asked for bribes, and a handful later ended up dead. That man’s family sold their shanty to afford his bail. As they spoke, neighbors flocked to also share their stories – eager to be finally heard. One woman’s brother was executed; one man’s son remained wrongfully behind bars; the rest had similar tales of woe. In slums, crime scenes, and jails across the capital, I heard the same stories of police abuse, and having nowhere to turn to. Injustice continued even after death as families were forced to bury loved ones using police-accredited funeral homes, owned by former cops or soldiers, who charged 10 times the going rate – some 800 euros gouged from those who barely earn a euro a day. That’s when I became political, because politics is personal – as personal as a fist in your face. None of that’s surprising if you consider Philippine history. Always in power is a revolving carousel of rulers, not leaders, who are variations of corruption, incompetence, and impunity. Never in power are we citizens who, in theory, should be able to use integrity, excellence, and community support to rise and lead our country, but who, in practice, cannot – not in a land ruled by oligarchs, celebrities, warlords, and dynasties. With typical impunity, our rulers even revise history. We’re now told that the tragedy of the dictatorship was written by the victors – who vanquished our strongman but have proved so untrustworthy that we’re willing to question history itself. If we don’t know whom to believe how do we know what to believe? In our social-media age, we’re influencers or followers, not pioneers and leaders. That’s why the authoritarian legacy of our past is alluring – because our dysfunctional democracy can supposedly only be disciplined by a strongman. 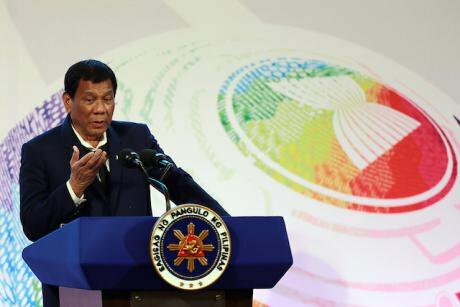 Many fear that Duterte is going in that direction, starting by burnishing his idol. Last year, the body of Ferdinand Marcos was re-interred as a hero, while his son came only 2 percent shy of the votes for the vice-presidency – a result he’s contesting and may well overturn. How can the family that stole billions, and oversaw tens of thousands of human rights violations, be steps away from ruling again? Asia’s oldest democracy has never been a democracy. We no longer know what it’s supposed to look like – how to define it, defend it, much less make it work. Roughly 80 percent of our legislature is ruled by dynasties. Political parties form not by ideology but by expediency and opportunity. Virtue is seen as hypocrisy waiting to be exposed, while vulgarity is spun as honesty attesting to authenticity. It often feels as if democracy, having bested communism in the Cold War, gave up making a case for itself across the world. It’s like the suitor who wins a bride, but after the honeymoon takes up drinking, habitually farts under the covers, and scolds her for not doing as he says. To such complacency, belligerent populism is a repudiation. To many, the West is sanctimonious – funding coups, exploiting resources, forging dubious relationships with leaders who may be bastards but are your bastards. When the democratic ideal gets hollowed out by realpolitik, who can admire what it’s become? Two percent of the population controls most of the wealth, media is polarized into biases, voters embrace fake news, reality TV stars wield nuclear missiles, and neo-imperialism displaces millions who are unwelcome in the countries who caused their displacement. As all that spirals, we seek truth in Twitter, find community in Facebook, and look to memes for wisdom. Meanwhile, countries like Singapore, the UAE, and China have dizzyingly thrived without democracy – astute in governance, benevolent in dispensation, single-minded towards progress. Democratic pieties be damned. To those who believe in saviours, Mr Duterte fits this zeitgeist: Angry, pragmatic, impatient towards western values, and ready to discard the human rights of suspected criminals to punish the human wrongs against unsuspecting innocents. It’s easy to understand why so many excuse so much. And so much has indeed been excused. For two years, Duterte encouraged others to kill criminals, vowing to fill Manila Bay with their bodies. When police killed 32 suspects in one night, he called it beautiful and said if “we could just kill another 32 every day, then maybe we could reduce what ails this country.” He declared he’d be happy to slaughter 3 million drug users. He promised cops pardons. And encouraged them to give guns to unarmed suspects. Our justice system has never been effective in punishing criminals, and many insist that the victims of the drug war deserve to die. They reject the undeniable logic that the government is ultimately responsible – either complicit in the violence, incompetent in stopping it, or both. In this form of populism, every killing is overdue judgment without due process ­– no trial, defence, witnesses, or sentencing by an accountable representative of the state. Duterte’s supporters celebrate the surrender of hundreds of thousands of drug users, and a crime rate that has dropped 10 percent. But that’s simplistic. The murder rate is up 30 percent. More than 50 kids have been killed in the drug war. Evidence often implicates police. And the government has quashed efforts to stop the bloodshed. Opposition figures have been jailed or accused of crimes. Whistleblowers have fled the country. Media companies are taken over, discredited, or threatened with closure for their criticism. The heads of institutions constitutionally mandated to limit the president now face impeachment and removal. Dissenting voices are cast as destabilizers and suffer character assassinations, criminal charges of libel, and threats of violence. That’s how populism subverts democracy in places like the Philippines – by posing as democracy... frustrated by too much freedom. That’s how populism subverts democracy in places like the Philippines – by posing as democracy paralyzed by checks and balances, frustrated by too much freedom. Popularity, in all its might, is cast as right – even if actually it is wrong. Through propaganda, online abuse, fearmongering, and tailored legislation, those at the top are using us – our faith manipulated into ceding our remaining protections. Hindered in discourse and oppositional representation, the minority is bullied by the majority who serve those in authority; it is simply élitism in sheep’s clothing. Cruelty posing as pragmatism. But if we really are pragmatic, this is my question: What if a benevolent strongman turns no longer benevolent? Some shrug, saying our ruler is trustworthy. Okay, then, what happens when the benevolent strongman isn’t strong enough to be benevolent? With our democratic protections dismantled, how can we protect ourselves? Fortunately, we’re not there – not yet. Our democractic institutions shakily hold on. For now, we must safeguard our democracy by refusing to save it by undermining it again. To those above the law, we must stubbornly apply our laws. Mr Duterte has to be held to his mandate as a democratically elected president – with all its accountability and constitutional limitations under which he must serve all Filipinos. By that he will be judged, to later face his alleged crimes, to be exonerated if innocent or punished if guilty. We demand due process for him because he’s rejected it for others. But as I said, this isn’t his story. It’s ours. The problems run beyond him, as do the solutions. Duterte is a symptom, and symptoms reveal our course of treatment towards a cure. Our body politic is feverish, fighting to be healthy. I admit, it seems contradictory. Citizens are angry – but never in my life have we been more politically engaged. Social media is abusive and divisive, but also provides unparalleled opportunity for discourse. Populism succumbs to demagoguery, but populism by its definition pursues the concerns of the people. Democracy is under threat, but now we who believe in it must work for it to survive. Our personal roles are increasingly clear. Citizens are angry – but never in my life have we been more politically engaged. As a teacher and writer I try to instill in my students and readers the daunting responsibility of seeing themselves as leaders. Because that’s what every single one of us turns out to be, usually without realising it. Whether it’s leading your family, household, church group, team of workmates, community, city, or nation – we are all leaders. And such broad leadership thrives only in democracy – that system of small groups represented by chosen individuals, that together form larger groups in which everyone is represented and empowered to participate, so that no one is either indispensible or overlooked, so that power is an opportunity held equally by all and not just an élite group or trusted savior. I also urge my students to think not what they’ll be when they grow up – doctor, lawyer, politician – but instead think of what problems they want to fix, because our problems are many, and if they can identify those that stir their passions then they’ll know what courses, skills, perspective, and careers they need to solve them. Because isn’t that democracy? Not choosing who gets to be strongest, and supporting them as followers. But ensuring that the weakest is supported to lead their loved ones into a better world where all of us are empowered to take an active role in finding solutions? Philippine democracy still stands, such as it is. And our median age is 21-years-old. I naively find hope in history’s continuing arc. Bad examples often teach us best how to be good – and the next generation can choose from so many. One of my students remarked recently that watching our old fogey leaders run the world is like watching your grandmother trying to operate her first smartphone. And he’s right. Perhaps we should listen to those who have their whole lives at stake, while much of ours is squandered. And empower them with all they need to thrive as leaders. And in the meantime do our level best not to scupper all they’ll inherit. For clearly it’s only through them that real change is coming. How, now, concludes this tale of populism in the Philippines and its wobbly democracy? We end where we began – at that intoxicating rally, with that man wearing his hope on his chest and waving the Philippine flag. We leave here tonight with his wise demand: “It is up to us all."